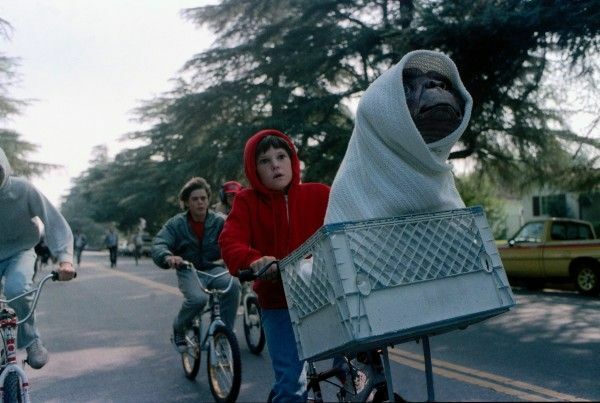 Steven Spielberg’s cross-hitting family classic E.T. needs no introduction. Do I need to summarize the plot? – How a lonely boy discovers an abandoned wide-eyed friendly alien and their resulting burgeoning friendship. It’s the rare film that exceeds the barriers of twenty-four frames per second. I can say Reese’s Pieces or bike or phone home without any sort of context and millions will know exactly what I’m talking about. It’s a juggernaut – and it’s been so for over thirty years. It’s a picture that wears its heart on its sleeve – and it remains the most true and personal of Steven Spielberg’s ridiculously compelling oeuvre. So it’s crazy to think E.T. hasn’t yet been released on Blu-ray. That slight will be corrected Tuesday October 9th, as the picture finally gets the Blu-ray treatment. 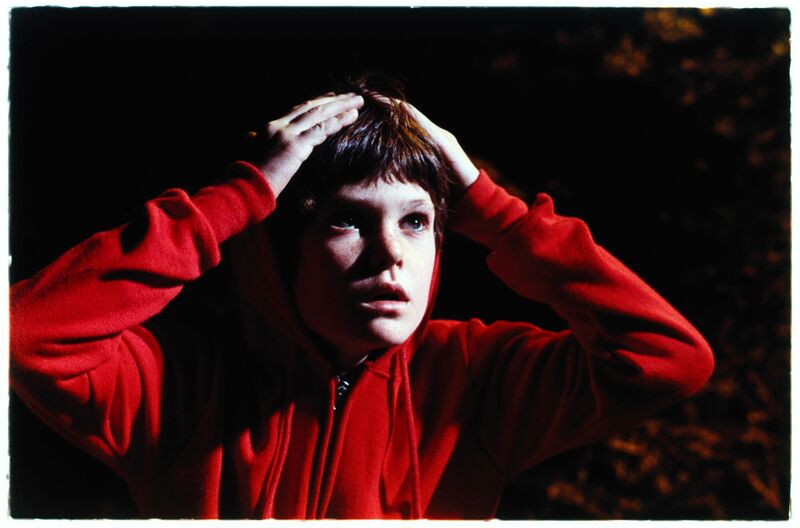 And in honor of such an occasion and to celebrate E.T., Producer Kathleen Kennedy and Star Henry Thomas (Elliott) spoke with select press for over ninety minutes about the affect E.T. had on their career, the shooting process, working with Spielberg and dealing with the phenomena the film became. In addition, Kathleen Kennedy discussed her new role as chairman of Lucasfilm, Jurassic Park 4, an upcoming adaptation of Roald Dahl’s B.F.G. and Spielberg’s next Lincoln. For the full interview, hit the jump. What did you think of the behind-the-scenes feature on the Blu-ray? HENRY THOMAS: I haven’t seen it – but I’m excited for the John Toll footage. KATHLEEN KENNEDY: We never released it and it was all shot on 35mm. I don’t think much of that has ever been seen. When it came out on DVD, there was the special edition version that had some notable changes (walkie-talkies in the government agents hands instead of guns, sanctifying certain dialogue exchanges) but the Blu-ray reverts back to the original version. What brought about that decision? KENNEDY: To be perfectly honest, I think Steven always regretted having made the decision to do anything to the film. I think he was feeling a certain amount of pressure to be politically correct. And then he realized that it maybe wasn’t the correct [decision]. I think most fans and most people who like classic movies that have stood the test of time, don’t want them to be tinkered with. How difficult would it be to get E.T. made now? KENNEDY: You know I think about that sometimes. I think E.T. came about at a time when it was meant to be. I think a movie like E.T. today wouldn’t have resulted in necessarily the same phenomenon. It’s hard to take apart thirty years to try understand what might contribute to that but I think that there’s an innocence to the storytelling and filmmaking. It was at a time when family films in general were really designated primarily for children and only for children – so the idea that movies crossed over and included the broad spectrum of family entertainment was a relatively new phenomena. E.T. was the beginning of that. Because I remember at the time actually sitting in a marketing meeting and we were having a lot of trouble booking enough theaters. Steven sent me in to basically go say to the studio “I’d like it to be in a 1100 theaters.” That’s not a lot of theaters — and they said “No”. We ended up eventually getting there when the movie started to preview and it was clear we were reaching a wide audience. But initially it was seven or eight hundred theaters. That was the compromise. 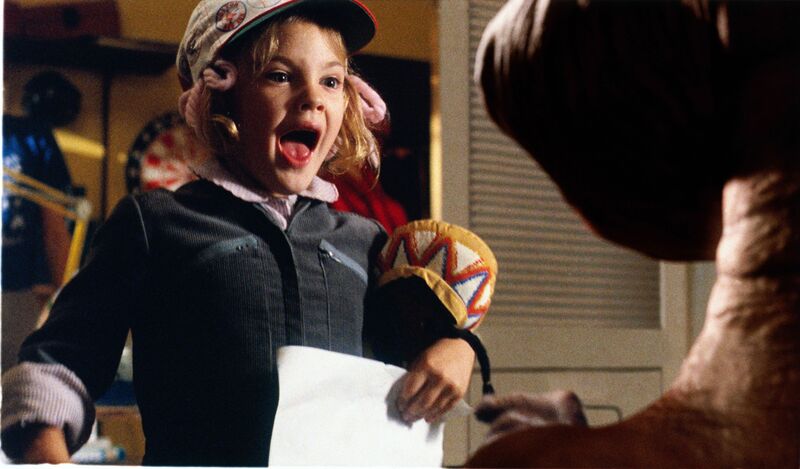 What are your earliest memories of E.T.? KENNEDY: We started out talking about a movie that was quite different. Steven and I had just started working together – we were actually working on Raiders of the Lost Ark. And he said to me “You know when I was doing all the research, there were reports of UFOs [that] were unexplained. There was this case in Kentucky – The Hopkins Case – go find out about that because it could make an interesting movie.” So I [made some calls] and sure enough there was this really interesting case, which involved a family who claimed they had been visited by creatures from outer space. They were all put under hypnosis individually and they all described exactly the same thing. So it was one of those stories. Enough to suggest something happened that we can’t explain. I was gathering all the information on this… I had gone to see this movie called The Return of The Secaucus Seven that John Sayles had done. I came back to Steven and I said, “I think this is the guy that should write this.” Now I had no idea why in the world I thought John Sayles but [Steven] actually agreed with me. We brought John Sayles in and he wrote a script called Watch The Skies. It was about this alien invasion essentially. It was still a small movie. Not alien invasion in the way we think of movies today. It was still a fairly small-contained movie. We were visiting Gary Kurtz who had oddly enough just produced Star Wars and we were making our way back, having had dinner at his home in England and we both were reading this script. It had just come in. We’re in the car reading the script and the very last image of the script is a little alien left alone looking at the sky watching his space ship leave. And Steven said, “I don’t want to make this movie. 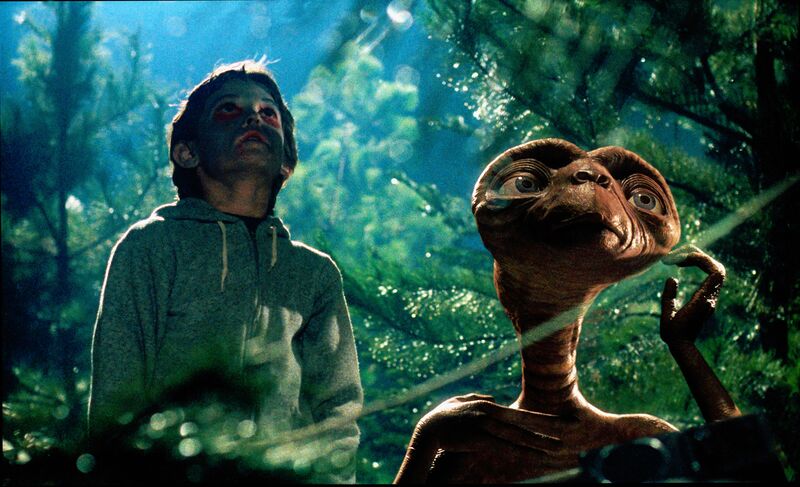 That’s [the alien watching his space ship desert him] the movie I want to make.” And that was the genesis of E.T. Because he had identified something he had done in Close Encounters, which is that he had explored this benign relationship to whether or not UFOs or creatures from outer space might come to earth. He saw it as a benign experience not a confrontational one – so that was a much more attractive way of looking at the story. He said “Well, we have to find a writer now”. Harrison Ford was dating Melissa Mathison at the time. And Melissa was visiting the set of Raiders of the Lost Arc so that’s what led to Steven and I sitting down and talking to her about this idea. She had written Black Stallion and we both loved Black Stallion and thought that was exactly the tone of what E.T. might be. All of those pieces came together in an odd way. When I was growing up E.T. was very real to me and I’m curious being on set with the puppet and effects, how real it was to you? THOMAS: I was aware of the reality of the wires and the twelve guys on the other side of the studio operating him – but there was definitely on the set, an air of magic where you could easily put yourself in a situation where the cameras were gone. Part of that was being ten years old but I think for Drew Barrymore who was seven when we were working together, he was very real. She worried about him when we went to lunch – ‘What’s he going to eat? Why doesn’t he eat with us?’ It was an easy world for me as a kid to fall into and ignore the man-behind-the-curtain so to speak. What is your relationship with the movie now? Has it developed over the years? THOMAS: I don’t watch it but the relationship that I’ve had with the film over these years has been evolving. I think when I was a teenager I was like “Oh god. They’re going to call me Elliot again and here we go…” But I have kids now… Also everybody that you meet especially people close to my age — they all have stories, very meaningful stories about seeing the film for the first time. In a small way, I feel proud of my own contribution to that. The film is so well regarded by so many people that you feel an obligation to represent it in a good way. What was it like working with Steven Spielberg? THOMAS: Steven – what I remember about working with him is that he’s just very enthusiastic about films. And you get the sense from him that if he could do it all himself, he would prefer it. But he is very good at telling you exactly what he wants out of a scene or your role in a scene. And he was great at talking to us. All of the sudden we weren’t kids any more but technicians on a film set. “Okay we’re going to do this. And I want you to say it this way and walk this way…” Steven was talking to me so much that the first time I saw the film I said, “It’s great but are you going to be able to take your voice out because I heard you talking the whole way through.” And he said “Oh no, no – you were imagining that. My voice isn’t on the film.” But it was so ingrained in me from working everyday on set that for me the experience of watching the film was almost like reliving those workdays. It shows me now how intrinsic he was to my performance because I was literally hearing his voice the whole time I was watching the film. And I probably still would have heard it had he not told me that his voice wasn’t on the actual sound. It was only my second film too. I still technically didn’t have a really good idea what I was doing other than hit the mark and say the line. I was a little kid and the cool thing about the way Steven worked – as a child he made you feel like you were a part of everything. Not just your character. He would take us to the art department and show us the sets that were being built. Sketches or different ideas for the creature and what he was going to look like and what he might have looked like before. Things like this so I remember as a kid feeling I was a part of the filmmaking process. And I usually don’t feel like that anymore when I do a job. On set how impressed were you by the young actors performances? KENNEDY: This is the first movie I ever produced. I was throwing up every weekend. I was so nervous. I had no idea what I was doing. So I have to confess I wasn’t thinking other than day to day and making sure everyone was happy. I was as nervous as the [kids] were. Given E.T. being your first solo producer credit and its unbelievable success, was there ever a pressure about topping yourself? KENNEDY: I only thought about it much later. In retrospect when I look back, its interesting – and I don’t know if you have this feeling Henry – I think once you’ve peered at the top, you can go on with your life and your career. I never felt it was something I was necessarily striving for. It wasn’t something I thought I needed. I had a glimpse of what that was all about and then I realized the work that I was doing was much more personal. It wasn’t about trying to get awards. So I look at it as – I had the wonderful good fortune to be involved in something that successful and that connected completely to audiences at the time. And I cherish little bits of that throughout my entire career. What was your first memory that E.T. was going to be a phenomena? What was Steven Spielberg’s response to the film’s success? KENNEDY: I think we were all very surprised. [Even] getting this movie made, we had to get a completion bond because nobody wanted to make it. It only cost ten million dollars, which even then was considered relatively small. I always say that was the only reason [Steven] asked me to produce it. So consequently it was a surprise to all of us. Because [Steven] thought he was doing something relatively personal and small and intimate. Almost everybody on the movie, it was their first major move career wise – whether it was our AD, our production designer, our costume designer… A lot of people were really young and just starting out in the business. So the whole thing was an explosive experience. And I think Steven shared that. Yes – he was coming off the blockbuster success of Jaws, but Jaws wasn’t a movie operating on a deeply personal level and this was. So that was a surprise to Steven. I think that’s an interesting and valuable thing for any artist, any filmmaker – certainly of Steven’s status – to recognize you can still have commercial success inside something that’s very personal. I think even today that gets forgotten sometimes. People want to make a distinction between what’s commercial and what’s art. I think Steven more than many understands you can combine the two. And E.T. inspired a lot of that. What is your relationship with Steven Spielberg and other filmmakers as you’re producing? KENNEDY: It’s different with every movie but we have a really nice collaborative working relationship. I think there’s a clear distinction between what I do and what Steven does. I see my role as… I spend a great deal of time trying to understand what it is he sees, what his vision is, what he’s trying to do. Then my challenge is to try to put the people and the pieces around him so he can hopefully execute at the level he sees in his head. I’m often trying to communicate what that vision is. So often movies today there are so many people around. They’re huge. I think back to E.T. – it was such a great experience with this small, intimate crew. And now these movies are like small armies. There’s no way a director can communicate with every single person on the set and yet they need to motivate and instill an ambition to want to do their best work. So I think the role of a producer and certainly my role with Steven was to help facilitate that. Does Spielberg ever talk about going backward and doing something small scale again? Have you shown E.T. to your kids? THOMAS: No I haven’t yet. My oldest turned eight this year and I’m going to show her when I get the Blu-ray. How do you explain your role in the film to your kids? Was it hard leaving the world of E.T. when shooting wrapped as a kid? Did you keep a memento from your time on the E.T. set? THOMAS: Yeah – we had badges to get on the set through security and I still have the badge. It has a different, phony title on the guest badge. ET and Me. KENNEDY: No one was really [merchandising] anything at the time. [Even] Star Wars when it came out – they didn’t have enough toys so you had to pick up gift certificates and then you had to wait until you could get the toy. We hadn’t done any [merchandising because we hadn’t] anticipated any of this success. One day I’m at my desk and I get this call from the FBI and they said “Look — we got two 747s at Newark full of pirated E.T. dolls. What do you want to do with them?” So from that point on, I looked at a call sheet that had two hundred and fifty phone calls from companies wanting to put together some kind of merchandising campaign. The reason we ended up doing any merchandising was to try to put trademarks in place so we could stop piracy. 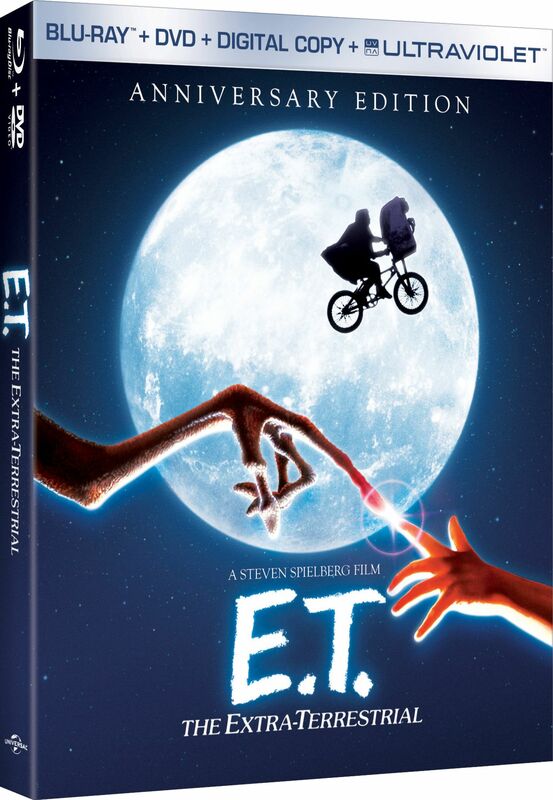 Has there ever been talk of an E.T. sequel? How did the look/design of E.T. come about? KENNEDY: The first thing Steven said to me was that he didn’t want a person inside the suit. And this is pre-CG technology – so that wasn’t an option. We were doing the design with Carlo Rambaldi. Steven knew the eyes were going to be really important. I remember we had pictures of Einstein, Ernest Hemingway, Carl Sandburg… Soulful faces and then Carlo came up with the idea of a cat – they have that sort of round fluffy face. And we used that in combination with these wonderful soulful eyes. It was just a lot of different combinations like that until we found something. You can’t really quite describe it. It just speaks to you. You connect to it in someway. And then I remember Steven’s law firm there were two major [attorneys] who worked for him. [One of them] Harold Brown’s daughter was four years old and I said to Harold one day “I’m really frustrated because I just don’t see how we can do what Steven wants to do without putting someone in the suit. Do you think you can bring Rachel over and we can put her in the suit just to see?” And he goes – “OK.” So he brings his four-year-old daughter over and we literally bribe her with McDonalds to get into the suit. When we put her into the suit, she goes insane. You have to remember at the time I don’t have kids yet. And I’m incredibly fixated on whether this suit’s going to work and we’re rolling video and she’s having an absolute temper tantrum. So it’s E.T. screaming with her dad in the background going “Just one more minute and we’ll go get a McDonalds.” [But] we did take that video to Steven and that convinced him we needed someone in the suit. What’s the story behind E.T.’s voice? KENNEDY: That is the brilliance of Ben Burtt. Ben Burtt is a sound designer and he was using a wide variety of sound samples over a long period of time. He had stopped into a drug store near where he was working to pick up an Aspirin or something. There was this woman standing up at the counter ordering and she [Pat Welsh] had this incredible voice. [Burtt] started to talk to her and he said I’m recording something down the street. Would you mind coming into the studio? She agreed. And what it was is that she had smoked Cool cigarettes her entire life and she had this amazing raspy voice that became the essence of E.T.’s. What was the most nerve-racking scene to shoot? THOMAS: I was super nervous [that] I had to kiss a girl in front of everybody. She was taller and older than me so I was pretty much just thinking about that. Steven said let’s have a rehearsal and we’ll try it just to practice. And I over-amped and we came together and our front teeth clashed. I remember her face going ‘Oooh’. And I thought this is not going to go well. 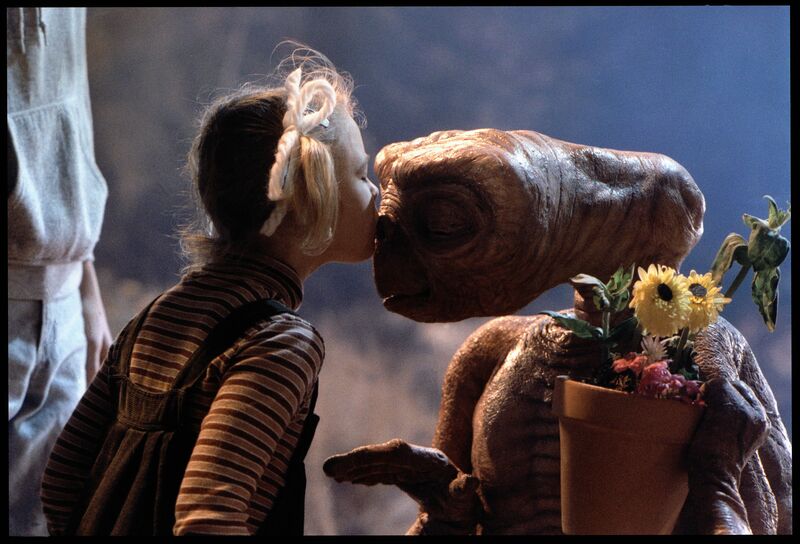 What was Spielberg’s kissing advice? THOMAS: It was Steven Spielberg’s kissing advice wrapped up into the guise of imitating John Wayne and Maureen O’Hara in The Quiet Man. So I had to catch her and wheel her in – but I was too short so Steven said it’d be really funny if you stood on this guy’s back. So it was really like a dance move. 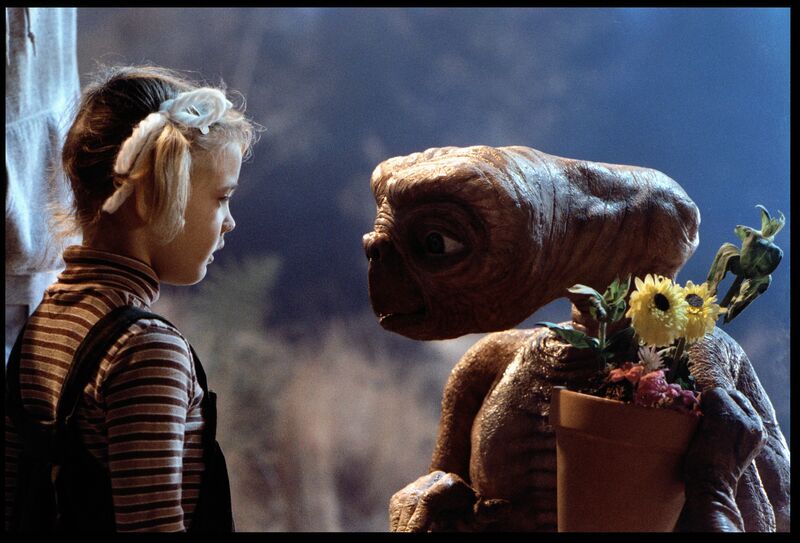 What was it like shooting that final goodbye scene with E.T.? THOMAS: We shot pretty much as chronologically as we could because Steven was concerned about the young performers and trying to make the arc as real as it could be. It was fairly towards the end of the shooting process and that was a hard scene to do because you knew the thing was winding down and it would be over soon. The thing that made the emotional investment payoff for me was that Steven had hired a mime that did all of the hand acting for E.T. She was always laying underneath the frame in between E.T. and myself so her hands could work. But it was really nice to have a human connection there. That was really a masterstroke of the direction. It really helped out the performances. What sort of themes do you see in E.T. and Spielberg’s work in general? KENNEDY: Many great stories are father issues, mother issues or death. I think many of the stories Steven tells are father-son issues. I think that’s something he often finds compelling: the dynamic of those relationships. And I think anytime, you find a way to explore those types of relevant relationships in any story whatever the size of the backdrop it’s a more successful movie-going experience. Storytelling has always been at the forefront of what he’s trying to do. Even looking at the Jurassic movies, I have to remind people there are about eighty dinosaur shots in the first Jurassic Park. Now it seems to be some sort of contest and unless you have two thousand effects shots, you don’t have a tent pole movie. But I think that’s completely wrong. Audiences still crave storytelling. What is the status of the fourth Jurassic Park film? KENNEDY: Writing, writing, writing. It’s really hard to keep these things going when there’s an expectation and a desire by the public and the audience to keep certain franchises going. As filmmakers, we often sit there constantly saying, ‘Okay. We have to answer the question, ‘Why do another one?” If you can’t answer that question, you shouldn’t be doing it. It’s tough. We’re trying to come up with a story that makes sense and isn’t going to disappoint people and is, hopefully, going to get people excited and reinvigorate the franchise. We’ve got to start with a script and the story. What is the conversation with the studio like? KENNEDY: They’re just like, “When?” They don’t care about the agony we’re going through. How does Lincoln fit into Spielberg’s filmography? KENNEDY: It’s entirely a human story. We’ve worked on this over a decade now, trying to finesse the script and get to a place where we felt we were ready to shoot. It’s always fascinated Steven. I think you can see now, by his body of work, that [while] he’s associated with something like an ‘E.T.’ or a ‘Close Encounters’ and popular entertainment, he’s also driven by historical stories that are rooted in real people and real events. This is, obviously, one of those. But it’s also interesting this is one of those movies where, unless the right elements came together in the right way [it wouldn’t work]. Daniel Day-Lewis being the perfect example. It’s like he was born to play this role. I’m not sure what we would have done if Daniel had not said ‘Yes’. He’s absolutely extraordinary. I’ve rarely been involved with a movie where, when I saw it for the first time, I thought, ‘What a strange feeling. It’s like we literally got this opportunity to go back in time and have this glimpse of actually seeing President Lincoln and how he might have operated. In this case, it’s a very specific moment in his legacy of an event he’s trying to deal with very close to the end of his life. You feel extraordinarily privileged to have this moment in time with him. That’s just how real he is in his performance. It’s amazing to watch him work. KENNEDY: Part of the reason that I wanted to go do that is because I do think the movie industry is changing. When you’re relegated to go from movie to movie, so much of what you’re doing is out of your control beyond creating the product. I just thought I’ve been doing this a long time, I love it but I really what to know where this is all going. Where the creative process is going. Some of the things that are going on with distribution online and available across many different platforms and in a wide variety of formats, I actually see as a good thing, I think it’s very exciting. That’s what’s intriguing to me. Hopefully being at the forefront of figuring out what that might be. 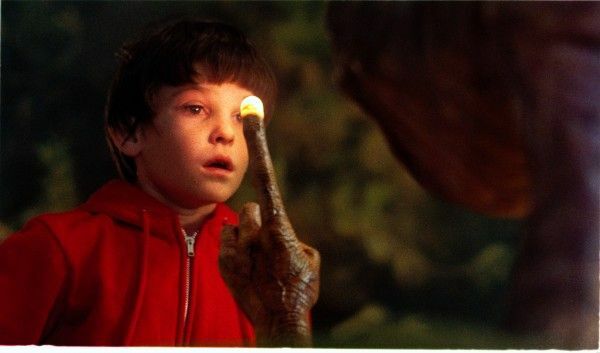 How did Michael Jackson get involved in the E.T. soundtrack? KENNEDY: It was right around the time we were doing the Storybook album. And interestingly enough that Storybook album never saw the light of day. It’s a beautiful box set where Michael Jackson narrates and Quincy Jones does all the music. Michael was doing Thriller at the time. So we would constantly be on the recording stage with him while he was doing Thriller and he would come visit us and we would all collaborate on this Storybook album. When we were getting ready to distribute it, an injunction was put against the album because the producer or publisher at the time felt that the Storybook album would be competition to Michael’s album Thriller – which is insane when you think about it. And they refused to let us distribute the album… [Michael] loved E.T. There was a time where he was renting out a movie theater near where we were all working and he would see it everyday. I don’t know how many times he saw the movie. He absolutely loved it… We talked about releasing [the storybook album] now – but because there was such a limited number made, we’ve never really [gone through with it]. I have a box of them [at my house]. How did E.T. change your life? 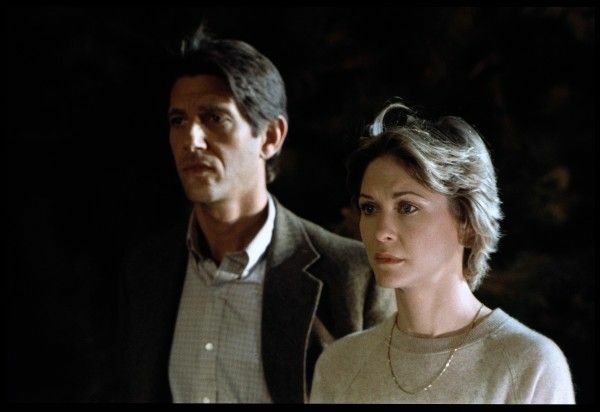 KENNEDY: …I look at it this way Steven and I worked together thirty-five years as a result of E.T. Frank and I got married as a result of Raiders and E.T. Melissa Mathison and I are still very close friends. We’re working on an adaptation of the B.F.G. (Roald Dahl’s Big Friendly Giant). Will B.F.G be live action, animated? KENNEDY: Live-action. We’re pretty far along. Can you talk about the John Williams score? KENNEDY: That was my first real introduction to working with John. I had been around obviously for Raiders of the Lost Arc. But I was intimately involved on [E.T.]. I was on the scoring stage all the time, the dubbing stage all the time. To this day, it’s my favorite thing to do. How great is it to go sit in a room and basically have your own concert for two weeks? There’s nothing better. It’s fantastic. He’s the most generous, wonderful sweet, accessible man. Ironically, Frank and I have spent a lot of time with John because Frank’s family goes way back in the music business. Everybody in his family is and was in music and his father was a composer and a jazz guitar player. Frank’s father, John Williams and Alan Bergman were all in the army band together. So that was this wild connection early in this process. 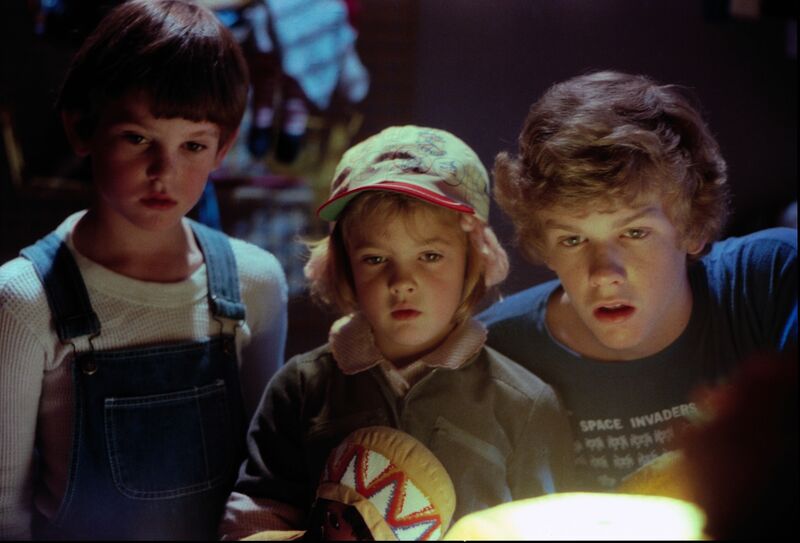 What professional lessons did you learn from working on E.T.? THOMAS: I still feel the same way when I go to work. Except I feel more confident. I’m less confused than I was most of the time. How has your process changed from being a child actor to adulthood? THOMAS: A lot – because there’s a process now. The one thing I’ve always done is to try not to overcomplicate anything. I didn’t do that when I was a kid. I just tried to take everything head on and through the least amount of filters as I could to serve the performance. And I think I still do that. I probably complicate things unnecessarily now just to give the illusion of professionalism. Has having such a high-profile role helped or hindered your career? THOMAS: It’s only helped really. The only obstacle that I see from it is that sometimes people say “Oh you’re the guy from E.T. Now I have you classified, I’m going to move onto this guy”. But some people are wired that way. They’re not going to get around that. And you always get that as an actor. Many times you walk into a room and people have already made up their minds. But it’s always good to have something great associated with you. KENNEDY: I can still vividly remember the scene Henry was in that made us say ‘He’s Elliott”. I bring that up because he was such a good actor. You were in Raggedy Man and you’re yelling at Sissy Spacek and you say, “You’re not a mother, you’re a telephone operator.” I remember Steven and I watching that scene and going “Wow.” And we immediately brought you in and you were so good. Where is the actual physical manifestation of E.T. now? KENNEDY: Well – he’s gone… there’s no way to keep him. All that disintegrates. So what we do is we keep the molds, the original molds. Even the touching of that material with your hands, the oil on your hands contributes to the gradual [decay]. ILM has actually taken stuff out of the molds and treated it in a way that can maintain [the material]. They’ve got the bike. Some matte paintings. There’s one matte painting I told George I’d really like to steal. It sounds so simple – it looks like a piece of modern art. It’s this huge painting and it’s the city lights when E.T.’s up on the hill and he looks down… It’s fantastic. So simple… Just great. E.T. hits Blu-ray for the first time October 9th.